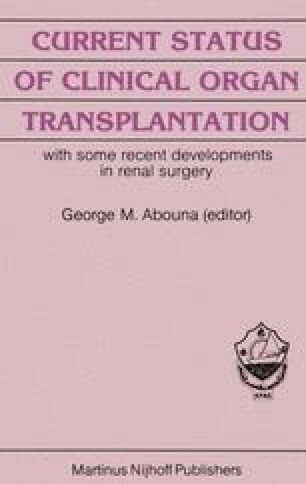 In transportation and sharing of organs between widely separated transplant centres, one of the most important criteria to be satisfied is that the kidney remains viable until it is revascularized in the recipient. Another less critical prerequisite is that the procedure of transportation and preservation be simple and in-expensive. Until recently most centres in North America have preferred to preserve kidneys and transport them by hypothermic perfusion using various machines as well as perfusates when ischemia time is expected to exceed 24 to 30 h (1, 2, 3). In many European centres however preservation in iced Eurocollin’s solution is generally accepted for periods of 40 to 48 h (4, 5). In the transplant centre in Kuwait we have had the opportunity to utilise 33 kidneys that have been imported from United States and Europe and preserved for periods of 30 to 60 h by either machine perfusion or by simple cooling in Eurocollin’s solution. We review herein an analysis of the performance of the first 30 kidneys which have been followed for periods of up to 26 months after transplantation.